2. Lamborghini Estoque | What Car? Lamborghini stunned Paris by wheeling out the Estoque concept for a four-door, four-seater saloon - and then dropped broad hints that it will go into production. Porsche (Panamera) and Aston Martin (Rapide) both plan to launch four-seaters within the next 12 to 18 months, and Ferrari already has the Scaglietti. 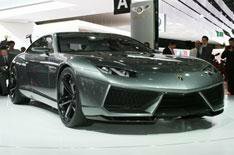 'To achieve a quantum leap in growth we have to think about adding a third model series to the two we already have,' Lamborghini officials said. To create space for four people and a 450-litre boot, the engine would be moved from its position just ahead of the rear axle in the company's Murcielago and Gallardo two-seaters to behind the front axle. That would ensure the Estoque retains at least something of a mid-engined car's weight distribution and handling. The engine would be a V10 driving all four wheels. 'This is a car for everyday use, but still extreme, uncompromising and very Italian,' Lamborghini claims. It is named after the daggers bullfighters use. Lamborghini's emblem is a raging bull.